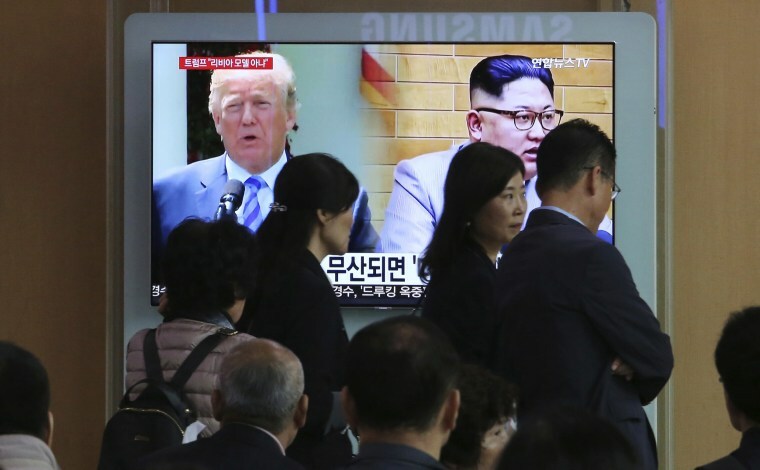 A U.S. delegation met with North Koreans officials in the Demilitarized Zone on Sunday as planning seemed to move ahead for the on-off-perhaps-on-again summit between President Donald Trump and North Korean leader Kim Jong Un. South Korea's president, Moon Jae-in, meanwhile, gave details about his surprise meeting Saturday with Kim in the truce village of Panmunjom, saying Kim had committed to sitting down with Trump and to a "complete denuclearization of the Korean Peninsula." The South Korean news agency Yonhap quoted a senior official from the presidential office in Seoul as saying Moon could travel to Singapore for a three-way summit with Trump and Kim Jong Un next month, depending on the outcome of ongoing discussions between Washington and Pyongyang. The trip would likely be made around June 12, the proposed date of the summit, which Trump canceled on Thursday, the official said, according to Yonhap. A three-way summit was the original proposal from Moon and Kim Jong Un when they held their first meeting at Panmunjom on April 27. Moon publicly raised the possibility again at a news conference Sunday, saying he hoped for a three-way summit "should the North Korea-U.S. summit succeed." U.S. Secretary of State Mike Pompeo tapped veteran U.S. diplomat Sung Kim to handle pre-summit negotiations. On a separate but complementary track is the CIA team that Pompeo set up last year when he headed the spy agency. And on a third track is a White House logistical group that was sent to Singapore on Sunday to prepare in case the summit takes place. It was led by Joe Hagin, the White House's deputy chief of staff for operations. Kim, the U.S. ambassador to the Philippines, also served as ambassador to South Korea and was part of the U.S. negotiating team that last held substantive denuclearization talks with North Korea during the administration of President George W. Bush in 2005. Talks with North Korea on a summit with Kim Jong Un were going "very well," Trump said on Saturday. The developments, after last week's whirlwind of uncertainty, appeared to flesh out Trump's assertion that the June 12 summit in Singapore could take place as first scheduled. Trump told reporters Saturday that there was "a lot of goodwill," that the original plan was still being considered and that "that hasn't changed." "We continue to prepare for a meeting," State Department spokeswoman Heather Nauert said in Washington as she confirmed that a U.S. delegation was "in ongoing talks with North Korean officials" in Panmunjom in the DMZ, which separates the two Koreas. The talks, which Moon said Kim Jong Un requested, capped 24 hours of diplomatic back and forth. They allowed Moon to push for a U.S.-North Korean summit that he sees as the best way to ease animosity that had some fearing a war last year. Kim may see a meeting with Trump as necessary to easing pressure from crushing sanctions and to winning security assurances in a region surrounded by enemies. Moon told reporters that Kim "again made clear his commitment to a complete denuclearization of the Korean Peninsula." Moon added that Kim said he's willing to cooperate to end confrontation and work toward peace for the sake of the successful summit with Trump. Moon said he told Kim that Trump has a "firm resolve" to end hostile relations with North Korea and initiate economic cooperation if Kim implements "complete denuclearization." "What Kim is unclear about is that he has concerns about whether his country can surely trust the United States over its promise to end hostile relations [with North Korea] and provide a security guarantee if they do denuclearization," Moon said. "During the South Korea-U.S. summit, President Trump said the U.S. is willing to clearly put an end to hostile relations and help [the North] achieve economic prosperity if North Korea conducts denuclearization." Before he canceled the summit, Trump didn't rule out an incremental approach that would provide incentives along the way to the North.